In Part 4, the final installment of this series, we unveil the key trends poised to shape the state of beauty for the next 10 years and beyond. 82% of women believe personalized technology will become more popular in the next 10 years. 91% agree that personalized technology will offer the average consumer the ability to monitor their skin health in the next decade. With our collective interest in what everyone else is doing, saying, liking, tweeting, and pinning, it’s no wonder that consumer claims are set to remain one of the biggest trends over the next 10 years. In fact, 76% of consumers believe the influence of social media on cosmetics’ advertising will increase over the next 10 years. Women love consumer claims—they rely on them to help make purchasing decisions, and they look for them when considering whether to try new products and brands for the first time. When a woman shares her personal feelings on how a product worked for her, it helps other consumers cut through the clutter of marketing messages and get down to the heart of the matter: is this product going to work for someone like me, with my skin concerns? Consumer claims help shrink the distance between a brand and its target audience by immediately connecting similar consumers together to share collectively in both the problem, and the solution. That’s why 81% of women believe consumer claims from women with similar skin concerns/in a similar age group will become more popular in the next 10 years. Intimate beauty is one of the next big trends to hit the industry. Consumers have embraced every kind of safe/natural/organic product to pamper their hair, skin and bodies, and all signs indicate they are ready to bring this level of product sophistication (and safety) to vaginal rejuvenation procedures, insertable pills/tablets to support feminine hygiene and freshness, organic tampons and even at-home vaginal facials. More than 50% of women are interested in purchasing organic/natural feminine hygiene products for personal issues (see F-1), such as dryness or odor, as well as natural/organic tampons, lubricants, and vaginal cleaners or moisturizers. 74% agree that multi-benefit devices will become popular. Today’s brands have to be able to back up their natural assertions. Today’s consumer is ingredient-savvy; they want all the glorious details on the chain of custody of your ingredients, from harvest to formulation to production to sale. And, because consumers are so dialed into ingredients, they are not shy about raising a social fuss to get your brand to change its ways. A continued focus on ingredient safety, and locally sustainable methods of delivering the best results, is clearly a movement for the next decade. In fact, more than 80% of women believe that botanical ingredients from the garden (coconut oil, coffee, etc.) will become more popular in the next 10 years. *The Benchmarking Company’s (TBC) “2016/2017 PinkReport: 10 Year Beauty Benchmark: A Consumer Love Affair with All Things Beauty,” provides an in-depth look at the U.S. female beauty consumer. 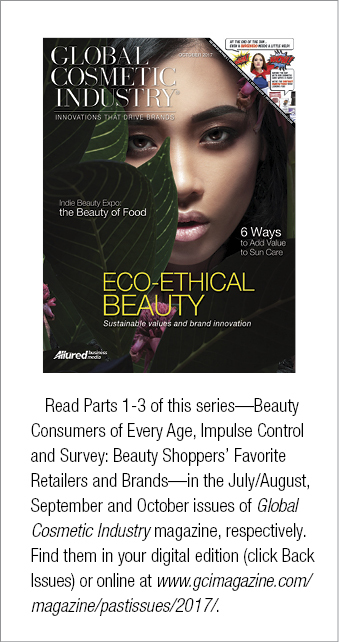 This report details extensive quantitative primary research designed to uncover the aspects of this consumer’s interaction with beauty, as well as what is and is not driving her interest in your brand or store. Thousands of U.S. women were invited to take part in the online survey, which was completed by 6,212 female beauty consumers who have used beauty products within the past 12 months of the study date. The comprehensive survey instruments, which included more than 75 in-depth questions, were developed based on exploratory psychometric and demographic questions. In order to qualify for this study, respondents had to be female and live in the United States, be between the ages of 18 and 70, and shop for beauty products. All research was conducted between May and June, 2016.